Dalston Junction 1985 by Mick Jones & Ray Walker. Keim Silicate. This piece is a grand memorial to one of London’s greatest mural artists. The Dalston Lane Mural, painted in 1985, has become an image that many people are familiar with, thanks to the new East London line station opening opposite it. 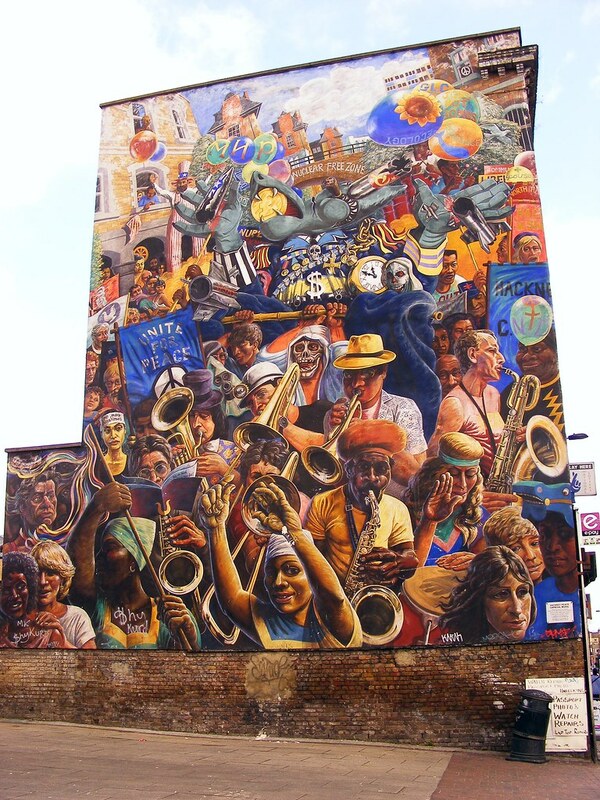 The mural, created by Ray Walker, is a composition based on the 1983 Hackney Peace Carnival. In the picture, the procession has just gone past Navarino Mansions on Dalston Lane. Trade union banners are waved to the right and to the left, a giant puppet figure representing the USSR and USA’s nuclear squabble is carried by men wearing skeleton masks. A brass band plays at the front of the as people watch them go by. The mural has a political message; it shows the unity of the carnival folk against ‘The Bomb’. Nuclear War is not the most cheerful subject matter yet the use of bright colours and the vibrancy of the people enjoying the march make this mural a joyful picture - it delivers energy and spirit! This quote comes from a leaflet from the London Muralists for Peace – a group formed in November 1982 for the GLC Year for Peace. This group was commissioned to create 6 murals in London with the theme ‘Peace through Nuclear Disarmament’. Ray Walker’s mural was one of the last to be started. Many sketches were made and a design completed. However before he had a chance to really start painting, tragedy struck and he died of a heart attack at the young age of 39. From there, his friend Mike Jones and his wife, Ann Walker, stepped in to complete the work. The mural was opened in October 1985 by Tony Banks, then chairman of GLC and significant supporter of London’s mural scene. Over the years the mural has been partly hidden by fences and then under threat when the new East London Line was developed. However, it has survived and thank goodness it has! It is in great condition and is one of London’s best murals. Hopefully in the future it will be listed and repair work will be carried out to keep it looking good. In May, during our North East London Mural walk, we met some people involved with the Open Dalston Group. They are keen to see the mural restored. Part of this will involve making sure the building that the mural is painted on is kept safe from development and is used rather than left empty as it currently is. The mural has been successfully restored by Paul Butler and Linda James working over the summer of 2014. Read more about Paul's progress here. The mural has been recently repaired using Keim paint. The render was secured to the wall and an anti-graffitti coating added to help ensure its longevity. If you travel on the East London Line, the train station comes out opposite the mural. If you are coming from the North London Line, take a right out of the station, and head towards Dalston Junction. Take a left at the junction onto Dalston Lane and the mural is on your left.